After a less than stellar encore with Hasbro's Playskool division, Teddy Ruxpin returned for a third time to the Animated Plush category in 1998. "TeddyIII" was licensed by Yes! Entertainment, the newest venture of Worlds of Wonder founder Don Kingsborough. Yes! marketed the line as The New World of Teddy Ruxpin, but unfortunately it featured very little new content, and the fate that would befall it was also a repeat of history. Yes! had found some success with the Yak Bak and other simple but interactive toys. They'd also produced TV Teddy, a talker which animated to videocassettes and 'beared' an uncanny resemblance to the Illiop Ruxpin. A "TV/Video Pack" using this same technology would be Yes! 's only real contribution of new content to Teddy Ruxpin. 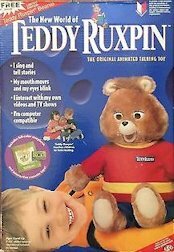 It was a device that would pair with Teddy to animate his commentary on video compilations of The Adventures of Teddy Ruxpin, using the same technology as TV Teddy. New audio was recorded by Phil Baron for the project. TeddyIII was roughly the same size as it's immediate predecessor, and again much smaller than the original. It featured similar inner-workings as Playskool's, too, with a single servo setup and inexpensive electronics which dampered Teddy's animation and shelf life. TeddyIII returned to the traditional cassette tapes used by the original, as opposed to the cartridges Playskool had utilized. These cassette tapes are not cross-compatible with the WOW version. It's storybooks retained Playskool's fragile paperback construction, with a new logo and color scheme that easily differentiated them from previous versions. TeddyIII was bundled with a small beanie-baby Teddy, capitalizing on the toy craze of the time. 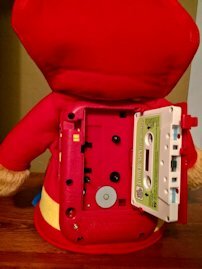 TeddyIII was also equipped with a "safety" that made it hard for even older children to change cassettes. A small switch had to manually be held and a handle opened simultaneously to gain access to the tape deck. Presumably, this was done so smaller children would not cause damage to the deck or endanger themselves with unwound audio tape. Teddy's most obvious change from his earlier lives, however, was the outfit. Worlds of Wonder executives had never been happy with the color scheme and tunic of the original Teddy, and many of them were making decisions again at Yes!. It was decided early that Teddy would be dressed in primary colors. While not a popular change amongst the fanbase at the time, TeddyIII's outfit has since become arguably the least of the concerns about this version. TeddyIII's appearance is even viewed with nostalgia by many of those who were first introduced to the character via this release. The storybook art was also edited to feature the red shirt and blue "jeans". TeddyIII hit the market in time for Christmas 1998. He was featured prominently in the year's Sears Wishbook and in online advertising (and for the first time, had an official website) but no television or print ad campaigns were created. A "Computer Pack" was advertised as a coming-soon feature, and supposedly would have had Teddy interact with online content. Phil Baron recalls recording for the project, but it never saw a release and no copies are known to exist. Several of the original stories were released and the VHS compilations of the television series which WOW had created also hit the market again (they had not been produced by Hasbro) The videocassettes featured a booklet insert with art or other extras related to the particular show. TeddyIII was hard to find. No major general merchandise stores carried the product. Toys R Us and KB Toys heavily discounted Teddy almost immediately, and collectors often scooped up large quantities in a single visit. Ebay, in it's infancy, was the most surefire place to spot one but those purchases came without the protections consumers found they needed with this version, and the market dwindled with little demand. There were reports of Teddy not operating at all, of the tape deck operating wildly with correlating audio problems, and of poor sound quality in general. A few Teddy's were found to have their fur unraveling from the body of the toy when removed from the packaging. Meanwhile, Yes! Entertainment was also coming apart at the seams. Similarly to WOW, they had saturated categories and too much capital had went to the wrong places. TeddyIII's sufferings were a side effect of these difficulties, but an inexpensively produced product with a name brand was also likely a deliberate hail-mary hope by Yes! to infuse some life into the company, with a belief they could tidy up the property later. That chance wouldn't come. Yes! filed bankruptcy in 1999, and their license was abruptly revoked. The product line was quickly liquidated and Teddy would be without a manufacturer for seven years, until a startup called BackPack Toys introduced TeddyIV in 2006. TeddyIII was welcomed warmly by a fanbase grasping for news of a return in the late 1990s. Yes! took advantage of this and over-promised even when they knew they would be under-delivering. Calls and emails to the company would result in a person hearing information the company thought they wanted to hear. A new TV series was even promised, although a new show had never even been pitched. "Better than nothing.... Hey, it's still Teddy!" was the sentiment once product had launched and been reviewed. Sweetened a bit by nostalgia, that remains our judgment in a nutshell. The TV/Video Pack was a fun add on and is worth purchasing a working edition of this version. The pack will not function without TeddyIII, and will not work with any other version. While finding a fully functioning TeddyIII is rare, it's common to find one that no longer animates but will still act as a speaker. We can't recommend this version as a singular doorway to Teddy's storyline, nor for a child, considering it's fragile components and outdated technology compared with the later BackPack and Wicked Cool Toys versions. Teddy's third incarnation was flawed and clearly rushed from the outset. Just a glimpse at it's box paints the picture. A WOW Teddy dressed in a red shirt, was used for the photoshoot - presumably because their own version wasn't yet ready for prime time by the time design needed to begin. TeddyIII, with all it's flaws, still holds a special place in the hearts of a greater number of fans than the Playskool version, and love covers a multitude of sins. 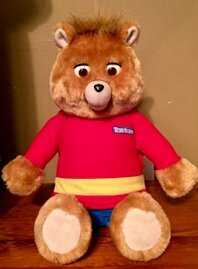 If for no other reason, the serious collector should definitely own one for it's individuality, a value that The World of Teddy Ruxpin and it's fanbase celebrates. A mint condition and operational TeddyIII is rare in more ways than one, in that it's value is often in the eye of the beholder. While other versions of the animated toy have a generally accepted price range in this condition, a Yes! version can fetch as little as $40 up to nearly the price an original WOW version will command. TeddyIII has a nostalgic following that only the original version overshadows. Many fans who grew up with this version now want to pass it on, or own a working one again. Because repairing these is nearly impossible, we advise frugality even when purchasing one that is proven to be operational. Partial-Operational TeddyIII's in mint or good condition are worth $20-$30. As noted in our summary, the version tends to continue to work as a tape player even when the animation functions cease. A unit that is not in good physical shape nor operational should probably be offered for a ' repair parts' price, to someone willing to take on the challenge. Book & Tape Bundles are worth $10-$15. The TV Video Pack will draw bids of $20-$50. As always, verify that any item you purchase has been tested. Make sure to purchase (and correctly mark for sale) the correct tape for the correct version of Teddy. They are not cross-compatible. Thankfully, it's fairly easy to tell the difference thanks to major differences in color scheme and Teddy's logo, in addition to different manufacturer logos.